We have had so much fun with baking soda and vinegar experiments. I decided to try a new base in our next experiment which we have plenty of: chalk. We always have odds and ends of sidewalk chalk and it was fun to re-purpose a little of it for this experiment. 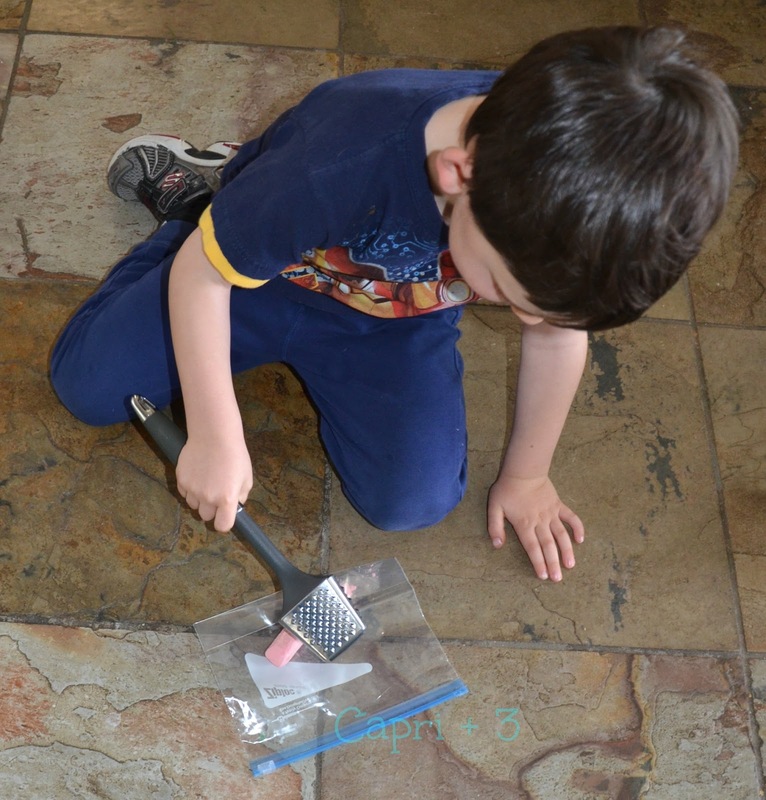 Place the chalk in a plastic bag and have the children take turns smashing it with a hammer or tenderizer on the flat side. Our kids found this task to be quite fun. It is not every day that I encourage them to smash things. Fill a plastic cup about 2/3 to 3/4 full of white vinegar. Have one of the children drop a handful or a tablespoon of the mixed color chalk into the vinegar. Watch what happens. At first, it will seem like nothing is going to happen. Then the magic begins and the chalk bubbles up little by little and then at a more rapid pace, mixing the colors as it floats to the surface. Discuss how vinegar is an acid and chalk is a base. The chemical reaction causes bubbles from carbon dioxide to form so that the chalk rises to the surface. We did this several times so that all four of our children could try it out. We tried one color at a time and the mixing of two colors. The color mixing was a little more dramatic. Visit the links below for more great chalk ideas from the #playfulpreschool team! What a fun experiment. I know my kids will love to try this. I never realized that chalk was a base…brilliant! Oh my goodness. My 5-year-old will LOVE this. Thank you for sharing! I hope your kids enjoy it. I buy vinegar in bulk because we do so many experiments with it! Luckily, it is inexpensive fun. I hope your 5 year-old has fun with this. Wow, that is very cool. I have never used chalk with vinegar. Can't wait to try it out! So fun!! THe kids will love that! I should try that in my classroom! What a great way – I've never though to use actual chalk we've done this with chalk stone from the beach and the kids find it great fun. That is a great idea! Let me know how you it goes if you try it out. I imagine the class would love the smashing as well as the experiment. Now we will have to try chalk stone! Thank you for giving us a new variation. Yes, the smashing can get most kids pretty excited! Then, the experiment is frosting for that experience. Wow. I didn't know you could do this with chalk. So cool! Wow! 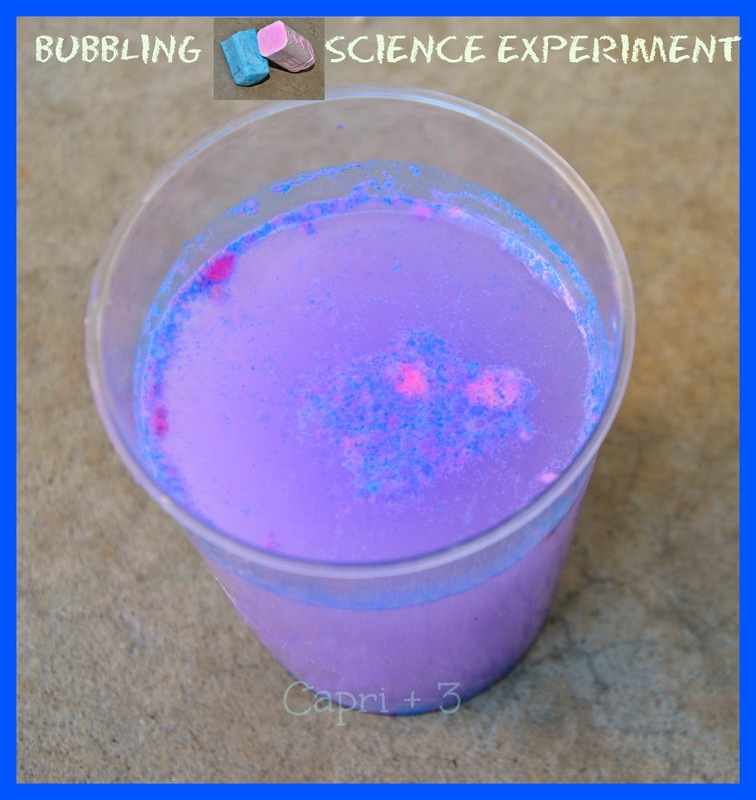 What a super fun hands on activity! It is not as dramatic as baking soda, but still fun. How fun! Can't wait to try this one out. They both love baking soda and vinegar, so I know this will be a hit! I love this! I'm always looking for science experiments for my daughter. And we have lots of bits of chalk all over our front yard… this is a great use for it! I'm so looking forward to trying this out! My girls are going to love it. This is not as dramatic as baking soda and vinegar as it takes longer for the reaction, but it is still really fun to watch. I hope your kids enjoy it. I think this will be a fun use of your bits of chalk. I hope your daughter enjoys it. I hope your girls have a great time with this. I hadn't realized that chalk would do this. My kids are always playing around with our sidewalk chalk, so I am sure they would enjoy this experiment. It is fun to watch. The reaction is much slower than baking soda but has a whimsical quality. I hope you had the chance to give this a try.